Figure 1 and Figure 2 show a classic bifacial cleaver from the Mauritanian Sahara. Cleavers are roughly U-shaped stone tool with a transverse cutting edge. 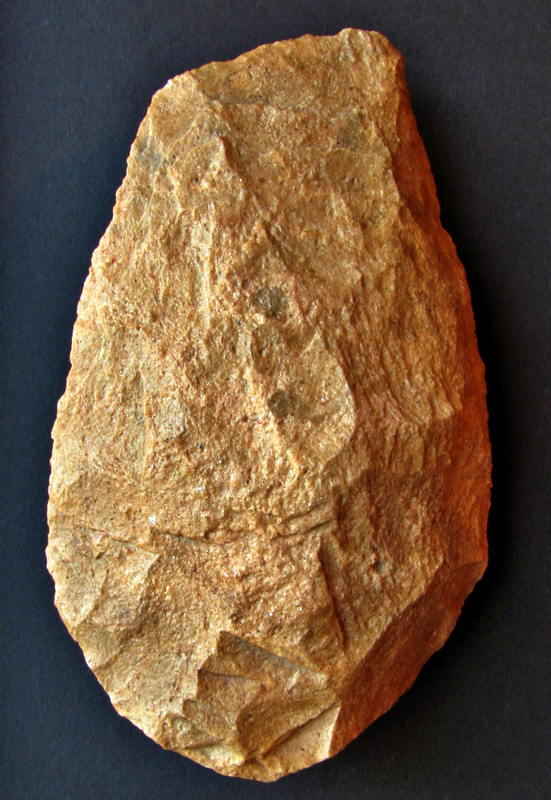 In Africa they are usually produced from a large flake, that is further shaped into a flake Cleaver; see here: 1003 or a bifacial Cleaver as displayed in this post. 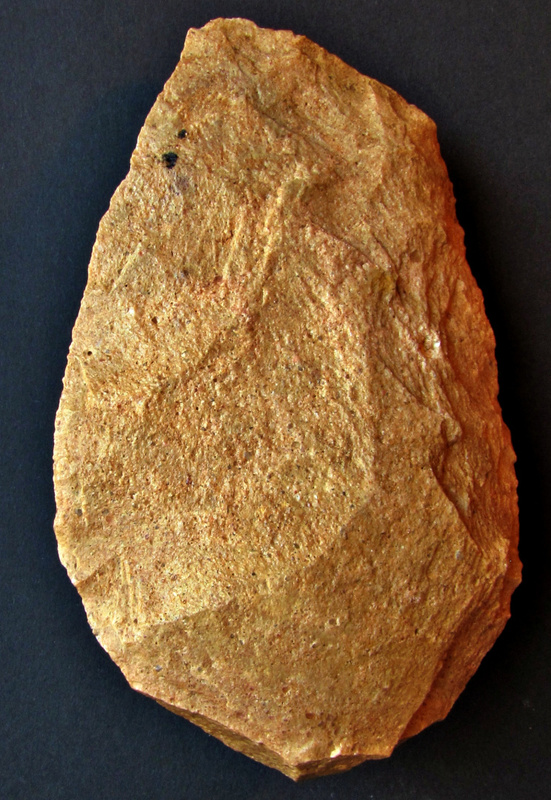 Bifacial cleavers resemble truncated handaxes with a straight or oblique edge instead of a point. On flake cleavers the cutting edge is generally formed by the intersection of the primary flake surface and a transverse flake seat on the upper surface. Cleavers seem to be designed and intentionally produced by their makers as large cutting tools. In Africa, cleavers occur alongside with handaxes from the late Oldowan right through the Acheulean. Acheulean sites vary from region to region with clusters in East and South Africa. At Sterkfontein cleavers have been securely dated between 2-1, 5 ma and at Swartkrans 1 ma. They occurred at many middle Pleistocene sites along the Vaal-river, at Amanzi and the lower level at the Cave of Hearths. Sites with cleavers are better known and investigated in East Africa. At Peninj on the western shore of Lake Natron (Tanzania) cleavers constitute 16% of all findings and are dated to 1.5–1.1 ma ago. At Olduvai Gorge, Isimila, Olorgesailie Kalambo Falls, Kariandusi and Melka Konture (Ethiopia) cleavers are also found in association with handaxes. By comparison, little is known about the Acheulean of central tropical and western costal Africa. This may indicate either a lack of investigations or is the consequence of low population densities during the Pleistocene. In the Maghreb, the oldest Acheulian assemblages are found in Late Lower Pleistocene deposits, circa 1 Ma, in unit L of Thomas Quarry 1 (Casablanca) at the Atlantic coast, and consist of artifacts made from quartzite and flint. Here handaxes, cleavers, large flakes, and picks (mostly on quartzite but with some flint) are common. The upper part of the Acheulean sequence is well illustrated at Cap Chatelier (Sidi Abderrahmane Cunette) and at the Sidi-Abderrahmane-Extension site (older than 376 ± 34 k.a. and 317 ± 64 k.a. BP). Although plenty of material has been collected in the Sahara (mainly by French expeditions during the 1950ies and 60ies) almost all of the cleavers in the collections come from redeposited accumulations and can only roughly dated to a late Acheulian 500-300 k.a. ago.